For Christmas breakfast this year, we are having Lobster Eggs Benedict (you can use crab). A light, sophisticated and totally decadent way to celebrate this most sacred of days. Last year I made the mistake of serving some cinnamon buns that were given to us. We don’t usually eat this kind of sugary, flour ladened, heavy food, but I was told they were a real treat. I wanted to try serving ‘forbidden food’, something I would never usually serve, and I thought my teens would be impressed with how open minded I was being. After eating only half a roll, I was full for the remainder of the day and I had crippling stomach cramps. Not even my 15 year old junk food loving step son enjoyed them. I was glad that my family had such a cultivated palette, but cooking Christmas dinner whilst feeling like I had a 10 baby in my colon, was not joyful. This is an easy breakfast to prepare when you want to join in with the Christmas fun and not be tied to the kitchen. You can even pre-poach the eggs. The hollandaise sauce is very easy to make. You just have to whisk egg yolks and butter together and it only takes about 3 minutes to make from start to finish. You can even pre toast the muffins and then just heat them before you serve. Here is another recipe you can make ahead of time Easy Gluten Free Bell Pepper Breakfast Bowl. 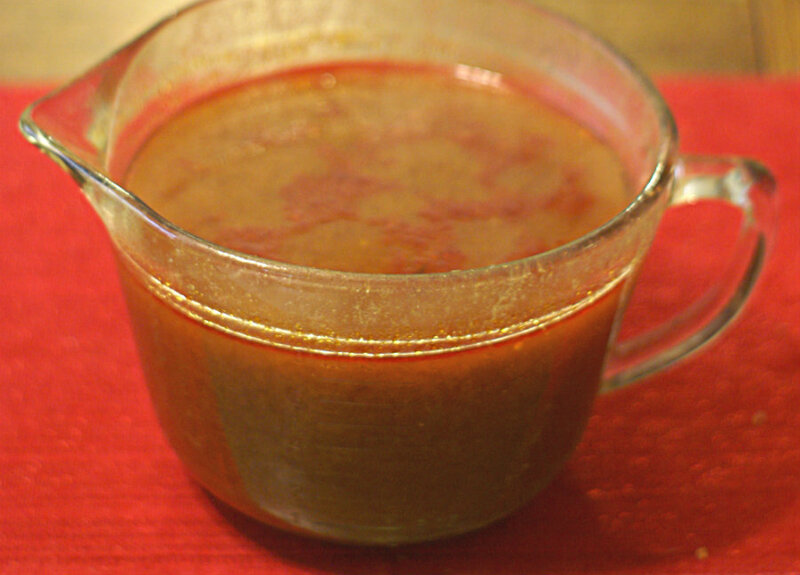 I also made some stock from the lobster shell, so I can make Lobster bisque for Christmas Eve. Just throw the shell in a stock pot with moix poix (celery, carrot and onion), garlic, a bay leaf, 1/2 lemon, 1/2 cup sherry, saffron if you have it, and let it slowly simmer for as long as you can. I put it on the stove at noon and took it off at midnight, when I went to bed. Freeze the stock in a Glass bowl with a lid until you need it. Whisk Yolks, lemon juice and water in a pan. Very lightly cook eggs on low, whisking constantly, until thick. 1½ - 2 minutes. Keep taking the pan off the heat so the eggs don't cook too quickly. Slowly add small blobs of butter and whisk. Let butter fully absorb before you add more. It's best to use butter that has been left out all night because it requires less cooking. Boil water in a pan large enough to cook required number of eggs, and take off heat. Gently drop eggs into water and let sit for 2-3 minutes. keep off heat for 2-3 minutes. Return to a gentle heat and poach for 2-3 minutes. Take eggs out and set aside ( if you want to pre-cook them, just cook until the egg can be lifted out. It should still be runny and only ½ cooked ). 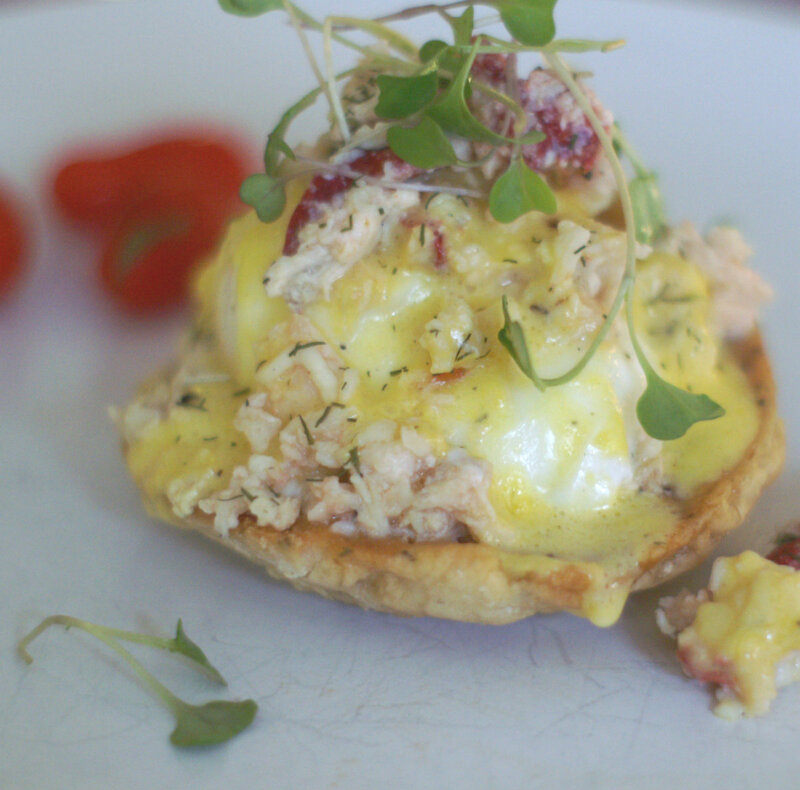 Put an egg on your toasted muffin, then a mound of lobster meat and top with hollandaise. Perfect!